Some Egyptian Women in this Revolution. It’s 8:45 am, Tuesday in Cairo. There’s been quite a bit of back-and-forth about the involvement of women in the Egyptian protests. Some say not; some say so. In the first couple of days I saw predominantly men, young/younger men. Then I started looking for veils, head coverings and began finding and seeing more and more women. Some of those faces have been captured in a slide show from the Global Post. Democracy Now! had this interview with “Egypt’s most renowned human rights activists, Nawal El Saadawi. A well-known feminist, psychologist, writer, former political prisoner in Egypt, she lived in exile for years due to numerous death threats.” It’s an amazing 6 minute interview. And you remember, Mubarak is the continuation of Sadat. And both Sadat and Mubarak, you know, their regime worked against the people, men and women. And they created this gap between the poor and rich. They brought the so-called business class to govern us. Egypt became an American colony. And we are dominated by the U.S. and Israel. And 80 million people, men and women, have no say in the country. And you see today that people in the streets for six days, and they told Mubarak to go. He should have gone, if he respects the will of the people. That’s democracy. Because what’s democracy? It’s to respect the will of the people. The people govern themselves. So, really, we are happy. Sounds a tad familiar. “They brought the so-called business class to govern us. 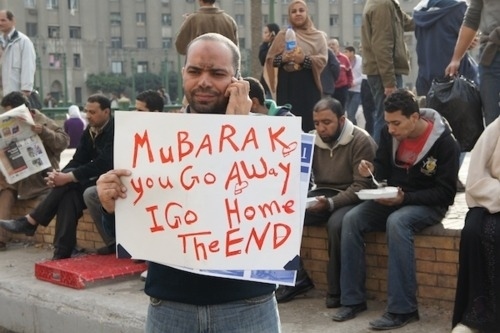 A compilation of some of ‘best protest signs’ of the Egyptian protests with one of my favorites below. Please note the woman over the sign holder’s left shoulder. CAIRO Jan 31 (Reuters) – The army said on Monday it would not use force against Egyptians staging protests demanding President Hosni Mubarak step down, a statement said. It urged people not resort to acts of sabotage that violate security and destroy public and private property. It warned that it would not allow outlaws and to loot, attack and “terrorise citizens”.